Yesterday was our CQTeer meeting (a small craft/art group I belong to) and the first couple of pictures here are two of the atc's I did for our exchange. The theme of the first one was 'Urban Moments' and what better image to illustrate that than graffiti? 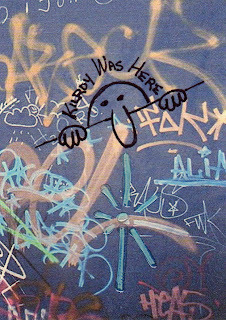 Do you remember Kilroy? He seems to have fallen from favour, but I can remember his image being all over years ago. (As a side note regarding the use of graffiti in art, please visit Allison Aller at http://alliesinstitches.blogspot.com and see what she's creating using graffiti...way cool!). Our second theme was 'India'. 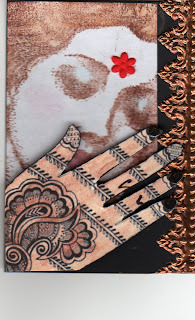 Trolling around on the internet yielded some interesting images of henna art and led to the creation of this atc. I can't remember the rubber stamp maker to give credit, but the copper trim on the right side came from ArtChix Studios. The final two pictures, which I forgot to crop!) are the front & back of a fibre book page I made for Irene whose theme was faces. The title of this is 'The Faces of My Creativity' which I carried out by making the left side of the page using denim and the face being somewhat normal. The first side of the page, the face is black and the background is some fabric I created using a dusting cloth as the backing. Paint, threads, Angelina too. To answer some questions from the post yesterday...for Christine...the yellow 'thing' I have stuck in my pocket is a long piece of plastic (somewhat like a yardstick, only pliable) covered with a soft felty fabric which is great to clean under really low pieces of furniture (like the refrigerator). This one is a commercially made item, but I'm sure you could make your own. To answer the other question...yes, I went to her house and NOT the local coffee shop!! Altho, come to think of it, my favourite coffee house here would have taken it fully in stride and not batted an eye. Would you want this woman cleaning YOUR house? AND it's not even Halloween? When we moved here nine years ago we let it be known amongst our friends that in lieu of a housewarming present (if they happened to be so inclinded) we would love it if they thought kindly of us when they were gardening and splitting off some of their perennials. The gardens here were non-existent other than for some grossly overgrown shrubs that needed to be removed. This is one that arrived on our doorstep and we have no clue as to what it might be. Each flower stem has several flowers on it, more or less all in a clump. If you enlarge the picture I think you can also see a bee having his lunch. Sorry there's no pictures of 'work' today, because Mrs. S. Claus has begun to create and not everything can be shown here until after Christmas! Actually, my TIF challenge piece for August was done and ready to show yesterday, but in all the excitement over our buzzy visitors I forgot to post it. As always, you can click on it to enlarge it to see the details. As for our 'visitors' (for anyone who didn't see my update yesterday), they all flew away about 4:30 yesterday afternoon. En masse and headed east. Jack heard them leave - it's pretty incredible how much noise that many bees make!! You might want to read Cindi's comment from yesterday because she has a great explanation of what we saw. We do think they were honey bees and it's too bad the beekeeper I called didn't get back to us. I would have loved to see how he would capture them. For those that were concerned, no, we wouldn't have hurt them. On the other hand, if they had been wasps, the fight would have been on. Yesterday afternoon about 4 o'clock we looked out our front window to see this: Thousands of bees swarming around. This picture only shows a very small portion of what we were seeing. After about an hour they all settled into our walnut tree and formed a solid mass about two feet long and a foot wide. It's now Monday...3 p.m. .....and they're still there. Umm...help? Updated to say: No, no...we wouldn't KILL them...no way!! B'sides, as of about 4:30 this afternoon, they took off in a hurry, heading east. Jack heard them from the garage and came out to see what all the noise was & saw them go. I had most of the day to stitch and it was wonderful! I have nearly finished my TIF block, but will leave posting a picture until it is actually done, which hopefully will be tomorrow. I did end up changing the upper plaid-ish section by adding some gold beads to the blue french knot flowers and I traded out the blue flower bead in favour of a gold one. I left the other questionable section as it was. The jury is still out about whether I will add a moustache to the lady as Arlee suggested. Thanks for all your input! So...because I have no pictures to show...I will give you some links I've discovered in my travels. and, last but certainly not least...there's another Magpie AND she has a lot in common with me!! Check out http://magpiescollectables.blogspot.com and be sure you see her wonderful doll in the header! Thanks to Marie for this one. There, that ought to keep you busy for a little while. Enjoy! I would never in a thousand million trillion (lots & lots) years EVER get into one of these things, but I can certainly appreciate their beauty from good old solid terra firma. This was taken just a few minutes ago from our back door. I actually made some headway on my TIF piece today. For some reason this piece is being very hard to get along with, at least for me. I'm not a huge fan of brown so that might be some of the problem but I don't think that's totally it. You see the plaid-ish looking part at the mid-top? Methinks I will be ripping what I've done there out because it's just fading away into the busyness of the fabric. The rusty area on the left isn't making me have heart palpitations either. I think the embroidery is too airy-fairy and should be more stand-up-and-be-counted. What do you think? Please click on the picture to enlarge and give me your suggestions. Any and all will be taken into consideration. Thanks a bunch! We grow 'em big here! I know - yet another picture of a sunflower! I couldn't resist taking this photo tho, so you can see the size of this one. It's more than 12 inches across. My DH is 6'2" so you can get a general idea of the size from that. The flower was so large that it just fell over. No creativity again today. I'm getting frustrated by all the wheel-spinning I'm doing and having absolutely nothing to show for my time. Oh well. There's always hope for tomorrow. I really wish I could translate the wonderful rich colour of this sunflower into fabric! I did a tiny little bit on my TIF piece today, but managed to spend most of the day celebrating my birthday which was LAST month! Not everybody can stretch the day out into a full month. Two separate friends gave me presents today so I feel pretty lucky at the moment! I finally got back to working on my August TIF challenge piece and here is what I've managed to do today. As always, click on the picture to see the details. I has occurred to me that some of you might not know about this method of separating stranded embroidery floss. I know it took me years to discover this little trick which makes it SO much easier than the old hold-it-all-in-the-air, grab-it-in-your-teeth-and-pull method. Please click on my very amateur photo to see it closer if you'd like. The top part of the picture shows a piece of floss separated into 6 strands at the end. In your right hand grab one strand and then, with your left hand, hold the remaining strands loosely. Pull on the single strand and it should just zip out, leaving a slightly clumpy bunch of thread in your left hand. Just straighten out the clump, grab another single strand and repeat the process until you have the number of strands you need to work with. Such a simple thing, and yet it saves tons of time and never tangles! No pictures today, sorry! I may have none to share with you, but I certainly saw a whole lot today. We went to a huge art show and saw tons of paintings and artworks - most of which were way expensive. Beautiful to look at, but I couldn't see them in my home. I was fascinated by some of the techniques they were using. One lady did very large paintings using encaustic wax and I would have loved to talk to her, but there was quite a crowd around her booth. Another artist did the most intricate paintings on feathers. I fell in love with a monarch butterfly he had painted but at $800 it was a bit too steep for my budget! I did come home with four 5x7" postcards from one of the artists which I hope to frame. I spent a grant total of $5! 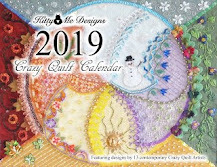 I will leave you with I site I have discovered: http://thegoldenthimble.com/craftylinks There are all kinds of links on there for many crafts. These are copper plant markers which I dipped in ammonia (stinky, stinky!). I filled a smallish container with ammonia and placed a piece of wire (aluminum??) mesh over top. After I dipped the markers directly in the ammonia, I left them on top of the mesh to dry. Not sure if that step was necessary, but I had to find a way for them to dry on both sides. Guess I could have hung them up. Anyway, I'm really pleased with the results! After all the excitement of the draw yesterday, today I am offering you photos of our garlic harvest this year. Good thing we like garlic, isn't it! We do share some of it, though. Our #1 son is a chef and takes any we can't use. I've been working on two 'secret' things and finished the Exquisite Corpse one up this morning. The other thing will be unveiled in due course. I'm excited about it and hope it comes together and that the recipient will like it. We'll see. But first, how be we admire some flowers? I know you're all anxious to do that...right? Right? OK, I thought so. This is one of the many sunflowers we have starting to bloom in our garden. Of course we have the regular deep yellow ones, but thought you might like to see something a little different. Isn't it pretty? OK...on to the winner...... I know you're wanting to see some more sunflowers, so here you go. This one is my favourite in colour because it reminds me of the rusting I've been doing with fabrics. The winner? Isn't this one a delicate colour? So pretty, and so are the goldfinches and chickadees that love their seeds in the fall. Oh alright ..... drum roll ..... the winner is ......CHRISTINE of MissMuffetTwo!!!!!!!!!!! Congrats Christine and to claim your goodies, just email me at marmic1954 AT hotmail DOT com with your snail mail addy and I'll ship it off to you in the next couple of days. Hope you like it! My mother had an expression that said 'I should have stood in bed' which she used to describe a day where she got absolutely nothing done that she planned and when everything that could go wrong, did. Today I should have stood in bed. My day began FAR too early having to be up to wait for the cable tv guy to come "sometime between 8 and noon". This is the second coming of this guy. He didn't show up the first time, so we weren't holding out much hope. Well, he came and brought an overwhelming amount of personality (NOT!). He hooked up the box, grunted, and left. ooookkkkkaaaayyyy....now what? After a great amount of fiddling, phoning, and cursing we finally (we hope) got it working. Oh yeah, and did I mention that the phone has been ringing off the wall all day (including a message left by some guy wanting the Worker's Compensation Board, which I only found out AFTER I returned his call...long distance). Don't you think he would have clued in when he got the answering machine and it DIDN't say anything about it being the WCB?? And then...to add insult to injury...my dad managed to set off his medical alarm, which meant the box for that was wailing away (LOUDLY) and we're panicking thinking he's in trouble. Jack runs for the backyard where dad was last seen and I, of course, had to stay by the phone for when the alarm co. called. Dad was fine, alarm co. didn't call BECAUSE they had a computer snafu and couldn't find our number. They were in the process of calling the ambulance when I called to tell them it was a false alarm. I SHOULD HAVE STOOD IN BED! You see this box? It will be winging it's way to someone after tomorrow, when I will be doing the draw. What's inside is a surprise but rest assured there are lots of goodies inside which I hope someone will be able to use to create with. There's also some of my creations in there too. This is the last post you can comment on in order to be entered to win so don't put it off if you haven't entered already. You just need to tell me your three favourite blog sites in order to have your name in the draw. This one (sorry about the wires!) was taken out the front door. Kind of wish there weren't quite so many trees to block the view. This is post #604 and, at the risk of creating too much boredom, here's another reminder to enter the giveaway! Leave a comment and include your fav 3 blogs on posts 600-605 to be entered in the draw for a box of goodies which I'm continuing to add things to. You snooze, you might lose on this one!! This is a pic of the experiment I did with rust and using blue fabric as the background. I'm not so happy with it. The fabric didn't seem to absorb the rust as much. I was hoping for a lot of rust and only a little bit of the blue. I had some time today to piece my block using the colours from SharonB's August challenge ( http://sharonb.wordpress.com ). When I first started looking through my stash I was afraid I wouldn't come up with the colours, but I think I did pretty well. I'm not a lover of brown, so it was difficult for me to use that colour. However, once I get this embellished I think I will really like it. 603rd post! Two more left for you to enter the giveaway. I started packing the box today and there are already lots of goodies in there for the winner. There's room for lots more too!! 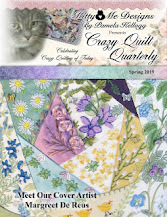 Be sure to leave your comment on posts 600 thru 605 with your 3 favourite blogs and why to be entered to win. For those that have already entered, be sure to check the comments and visit all the wonderful blogs!! This picture shows the two piece of fabric I had brewing with raspberries & vinegar (and bugs!). When I first took it out of the brew it was a fairly bright pink colour. I laid it on the grass to dry. I accidently dripped some of the rusty brew on one of the pieces and it instantly turned darker. Cool! I proceeded to accidently drop on even more. After the fabric was dry, I rinsed it and it turned a vague shade of purple, losing the pink tone altogether. The darker areas stayed dark tho, so I was happy. Cotton fabric. This picture is a close-up of a section of one of the rusty pieces. Again, I laid it out on the grass to dry and laid rusty bits over certain areas. This is where one of the rusty springs made a lovely pattern. Fabric is cotton. This piece of fabric is a cotton flannelette, which has turned out to be my favourite so far. The rust colour has really impregnated the fibre and very little of it has rinsed out. I'll be doing more of this!! The final picture is of a larger piece of cotton. You can see the spring pattern in the lower right of the piece. I also did a further experiment, which I will show tomorrow. Don't forget to enter the giveaway!! This is post #602 and you are welcome to leave a comment on posts 600 thru 605 with your three favourite blogs in order for your name to be entered in the draw. I apologize for the no-post yesterday. For some reason the day got away on me and I just didn't get a chance to post. Here's a picture of the fabrics that came out of my rust dye pail that I showed a few days ago. Aren't they pretty? I have another batch cooking away as we speak, plus I had some overripe raspberries (also FULL of yucky little black bugs!!) that I have festering away in another pail. I'm curious to see what I get out of it. Here's prototype # 2 of the knitting needle roll, which still isn't what I want. I know, I'm too fussy!! The way you see it in this picture is great for holding the long single-point needles, but not so good for the shorter double-points. Can you see the flap on the left side? It's the area that the shorter needles are *supposed* to fit into. Key word here is *supposed* because they don't. The pocket is about 2" too short. Back to the drawing board on this one!! This picture shows the short-needle pocket lifted up and that the area for the longer needles is perfect. I'm also not happy with the means of tying it up, so that will change with prototype 3 too. This pattern is Butterick B5006 as written. Ok, ok...I know you're all simply on pins & needles about what I'm planning for post #600. Who would have ever thought that I would find enough to mumble about to fill 600 posts. Who would have ever thought that I would even get one reader, other than my kids? I have readers, people!! Woo hoo!! And they're great readers too because they comment and they show interest and have ideas and they just generally support me in my creative journey. Thank you, a thousand times - all of you. Now, on to the contest!! I told you that you would have to work for this giveaway and so you shall - or your name won't go in the draw (so there). All you have to do is leave a comment with the following information included - your three top favourite blogs (this one is NOT to be included, because it goes without saying that it's your favourite..right? Right? Awww c'mon). A BOX OF TREASURES FROM MY STUDIO!!!!!!!!! Contents are being worked on as we speak. There might just be some of my art in there. There might be some components to work with. There might be....well, you'll just have to wait & see!!! Comment on folks, and don't be shy!